Sydney terror plot: The fourth man arrested has been bailed. The fourth man charged over the Sydney terrorist plot has been released from jail. 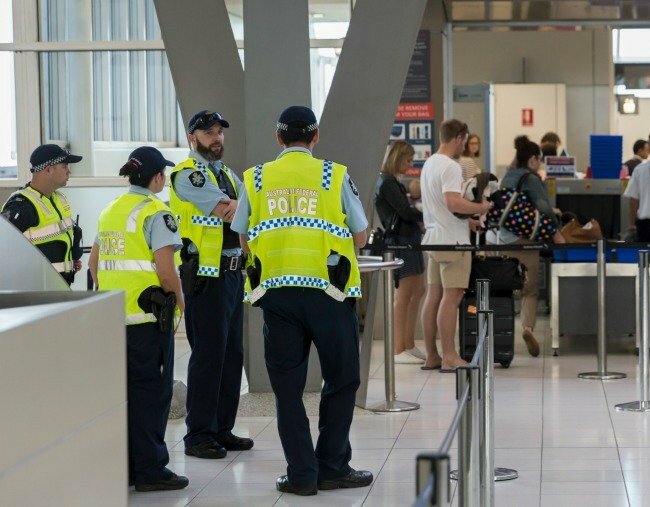 Just two of the four men arrested in Sydney over an alleged terrorist plot to bomb a passenger airline remain behind bars after the final suspect left in detention limbo was bailed by police. Khaled Merhi was granted bail after being charged with a non-terror related offence on Sunday, just over a week after police raided properties across Sydney over an alleged plot to bring down a flight bound for the Middle East. The 39-year-old was charged with possession of a prohibited weapon. Merhi, who used a grey hoodie to hide his face from awaiting media, had his right arm in a sling as he was driven out of NSW Police Headquarters. He was named by his lawyer Moustafa Kheir, who tweeted: “My client Khaled Merhi has also been released. Cleared of any terror allegation,” on Sunday afternoon. Merhi had been held without charge for more than a week under specific provisions of the Commonwealth Crimes Act relating to terrorism investigations. Meanwhile, two of the men were charged with preparing for or planning a terrorist act, while a 50-year-old man was released without charge. Khaled Mahmoud Khayat, 49, and 32-year-old Mahmoud Khayat, had their matter mentioned in Parramatta Local Court on Friday after being charged on Thursday night. The pair were refused bail ahead of another court mention on November 14, while Merhi was bailed to appear in Downing Centre Local Court on August 24.